more than 1000 times greater than the 27 million tons we just assumed. Could our current once-through use of mined uranium be sustainable? are not a sustainable technology. fast breeder reactors, the power would be 33 kWh per day per person. 4.5 billion tons per planet = 28 million GW-years per planet. Figure 24.4. Three Mile Island nuclear power plant. Figure 24.5. 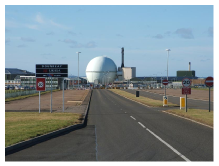 Dounreay Nuclear Power Development Establishment, whose primary purpose was the development of fast breeder reactor technology. Photo by John Mullen.